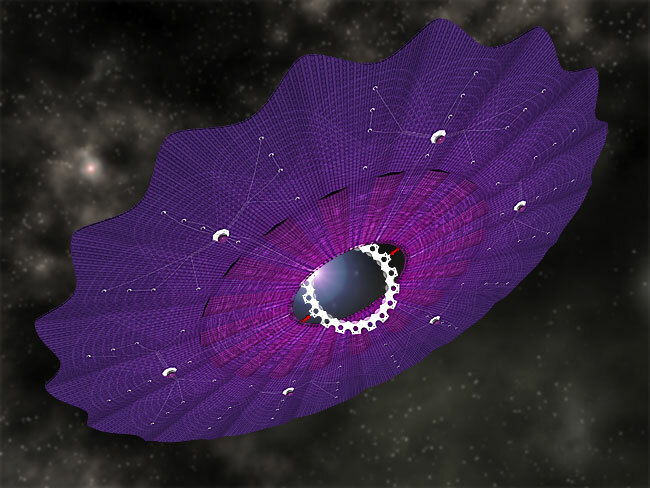 A circular purple solpan with an opening in the centre that contains a sprocket ring pivot suspended between two red spinters. 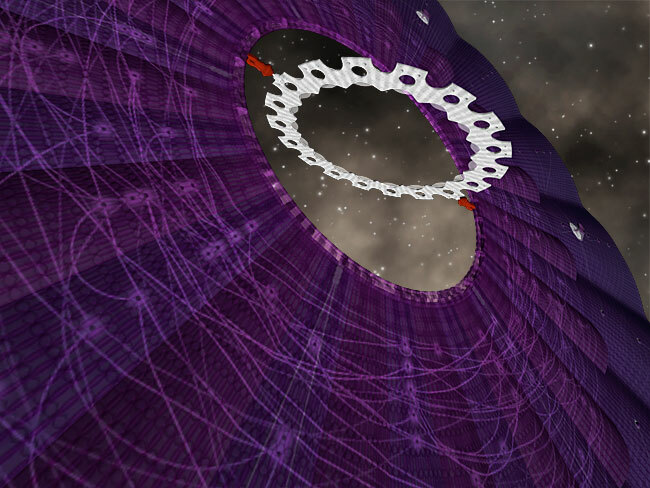 The solpan is two interwoven radially corrugated disks: the inner one is illuminated with electric tale-threads, the main one carries six embedded crosspider configurations of RFRS. The inner solpan edge acts as a rail for the two spinters. The combination of the spinters 360 mobility and the sprocket rings uniaxial suspension allows the sprocket ring to position itself independently of the solpans direction. 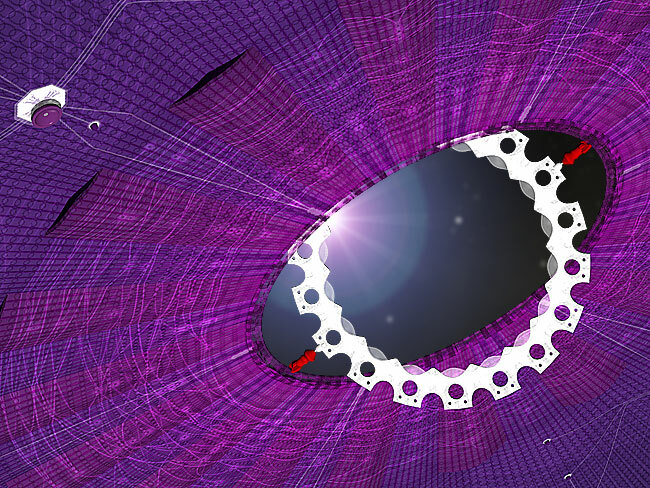 The sprocket ring consists of two intersnapped layers: a solid base made of protosiltanium and a clear enfiglass top. 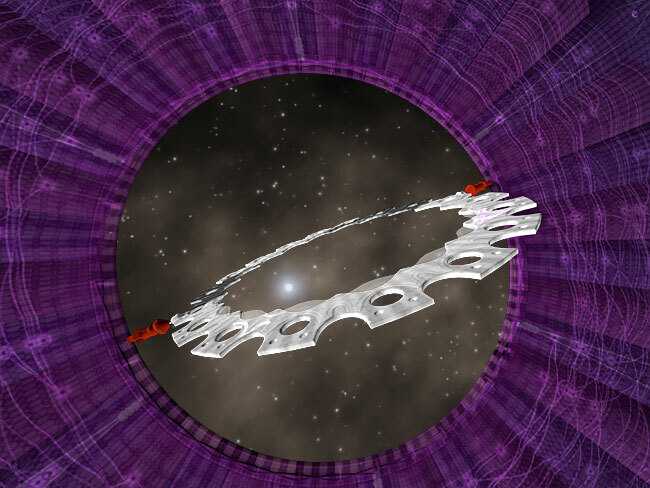 Both the sprocket ring and solpan can spin at ultra high frequencies, sometimes becoming invisible. Deep space. Flymation: chimney worm. Flomation: auhasard, diformae. Completely edible. The crispy solpan, source of carbohydrates and fibre, contains ucaruma, an aerobic fuelant, and suprosvare, a muscle rebuilding agent. The sprocket ring contains whistibeo. The friable spinters are full of bitter mellowtrama. Thoerhuls ultrapid signal processing and its ability to hold precise positions makes it an ideal component of ICNs. Its ability to pick up extremely weak signals and recognize languages stored in its library makes thoerhul the preferred scanner for historians. The library is devoted to linguistics. It includes a section on computer and robotic language, and contains source code for the Petaglot translating engine. Full deployment of emke defence when in signal-processing mode. Even when emke is off, Begorel, thoerhuls railog-based program, monitors the vicinity via RFRS and will attempt light electro-convulsion of anyone attempting to relay assembly line orders, artificial stimulation blips or aural nonsense to or via thoerhul. Repeat offenders will face harsh treatment, including high frequency kinetic emetic. Looking for what is hot and sizzling in the culinary milieu? One dish that is making a surprising comeback is the kivartitofe, a meal whose elusive, difficult-to-describe taste makes it an ideal dish to share with amnesiacs. Start with three thoerhuls. Remove the sprocket rings and spinters. 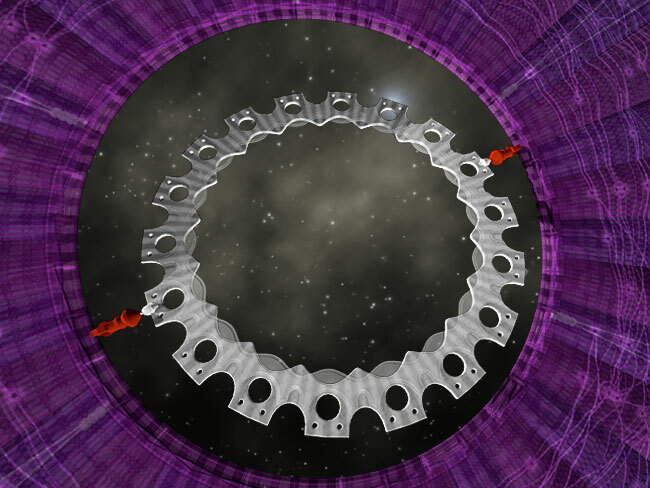 Send *RDPT to shrink the solpans to roughly the size of the sprocket rings. Remove the embedded RFRSs. Spray a deep, baking circular pan with oloil, pour in sojola thikomola sauce 1 cm deep. Place one solpan in the dish and sprinkle with triola spice then place the sprocket ring and cover completely with a thin layer of thikomola. Repeat to add two more layers. Cover the baking pan and place it in the freezer for at least 12 hours. Remove half an hour before serving. Turn the pan over and slide it off. Abox the kivartitofe, bebox 20 lemon-blue hotpellets; unimbler ad+ki. Remove and pour vodlobster or rhumpotato sauce into the smoldering chimneys left behind by the hotpellets. Serve with roasted peppelons and capers. Serves eight. Best with a bottle of Wi-Infi brewed Virgin Valley Malbec. One of the more accessible books in thoerhuls library is Pedro Lofos biography Speaking in Tongues. The deeply autistic Pedro graduated from Suomo at the age of 17 and went on to write the algorithm that allowed computer-based intelligence to recognize and learn the contextuality of human communication. Known as NoA, the algorithm was also able to identify humour, irony, fear and happiness. Pedro donated all proceeds (around 15 trillion liunits) from his patents to building Nantupian Park hucosphere and its cities and universities. He disappeared during the 2214 Ryekleba.